This article is about the video game released from 1987 to 1994. For the 2004 edition, see Sid Meier's Pirates! (2004 video game). Sid Meier’s Pirates! is a video game created by Sid Meier and developed and published by MicroProse in 1987. It was the first game to include the name "Sid Meier" in its title as an effort by MicroProse to attract fans of Meier's earlier games, most of which were combat vehicle simulation video games. The game is a simulation of the life of a pirate, a privateer, or a pirate hunter in the 16th, 17th and 18th centuries. Pirates! is set in the Caribbean. The Pirates! playing field includes the Spanish Main (namely the northern coast of South America), Central America and the Yucatán Peninsula, the entire Gulf of Mexico, Florida, and all Caribbean islands, plus Bermuda. The player is free to sail to any part of the above-mentioned lands, stopped by an invisible barrier southeast of Trinidad, all the way north to just northeast of Bermuda. The game was widely ported from the original Commodore 64 version to numerous other systems. The Pirates! Gold remake, with minor improvements and better graphics, was released in 1993. An enhanced remake, also named Sid Meier's Pirates!, was released in 2004. Versions for mobile devices have also been released. Pirates! is a single-player, open-world game. The player receives a letter of marque authorizing service as a privateer for the Spanish Empire, the Dutch Republic, the Kingdom of England, or the French colonial empire in the Caribbean. The player's loyalties may change over the course of the game; they may also hold rank with multiple countries and may turn to piracy at any time. Gameplay is open-ended; the player may choose to attack enemy ships or towns, hunt pirates, seek buried treasure, rescue long-lost family members, or even avoid violence altogether and seek to increase their wealth through trade. The game also has no predetermined end, although as time goes on, it becomes more difficult to recruit crew members. As the player character ages, fighting becomes more difficult, and deteriorating health will eventually force the character into retirement. The game ends when the player retires, at which point they are given a position in their future life, from beggar to King's advisor, based on accumulated wealth, land, rank, marital status, and other accomplishments. The era of play is one of the choices given to a player at game-start. Different eras provide a different challenge, as political and economic power shifts between the four fledgling European empires. Choosing 1560 (the earliest choice) as the starting year places the player in the Caribbean almost devoid of influence but that of Spain, while 1680 (the latest choice) provides a mature Caribbean with many non-Spanish colonies and an overall higher degree of activity in the region. The other choices include 1600, 1620, 1640, and 1660, with the progressive effect of reducing Spanish dominance in favor of the other nations, while increasing seafaring traffic. Ship designs are also era-dependent, with some types of ships appearing more frequently in certain eras and less in others, and certain ship types being used near-exclusively by certain nations. The game tests a wide range of skills: hand-eye coordination during the fencing sections, tactical ability during the land and sea combat phases, and strategic thinking, for everything from choosing a wife to deciding when to divide up the plunder. Moreover, each game is likely to take a different course, as most events in the game are random, including the economic and political systems, and early in the game, these can greatly affect future strategic options. In the course of the game a player may try to tack in a frigate in order to run down a smaller and faster pinnace, but must be fortunate enough to have the weather gage. One of the most innovative features of Pirates! is the introduction of a dynamic playing field. In Pirates! many of the most important factors which affect player decisions are randomized at the beginning of the game and continue to shift during gameplay. This not only creates a new experience each time the game is played, but also requires the player to remain flexible, and be ready to exploit possibilities when they occur. Changes happen whenever time passes and they are unrelated to player actions. In fact, in this game in the series, random events do not have any graphical representation, and the player can do nothing to prevent them. The most important random factor in the game lies in the diplomatic relations between the four nations laying claim to the Caribbean. Relations may differ greatly from game to game, and can shift in an instant, creating and removing opportunities, possibly even for long periods of time. The player generally benefits from periods of war between two or more countries, because any aggression towards a country's ships or cities, which occurs often if not specifically avoided, will gain recognition with its enemies, prompting them to bestow the player with land, titles, and other benefits. During peacetime, the player can only benefit from the capture of pirates on the high seas, which is seen as favorable by all nations, but is a rare occurrence. Cities are also dynamic, with statistics like wealth and population fluctuating constantly. The player can access any city's statistics. Knowing the statistics of a city helps the player plan ahead, especially with regards to trading or any desire to raid or conquer cities. The original versions of Pirates! sported both disk and manual copy protections. Users were asked the time at which various treasure ships were arriving at the port. If the time was wrong, the game would continue, but at a much higher difficulty level that would frustrate most people. In early 1986, Meier and fellow MicroProse designer Arnold Hendrick wanted to create a role-playing adventure game, but Meier's business partner Bill Stealey was skeptical of producing non-vehicle simulations. The company planned several game elements that it removed before release, including multiple NPCs per town, more detailed sailing including fleet actions, and a subplot involving religion and nobility. Pirates!' success resulted in the similar Sword of the Samurai. With five successful years behind him, Microprose considered star designer Sid Meier a selling point and chose to put his name on the box of his next game, despite a shift away from combat simulators he had become known for. Meier in his interview said that "Pirates! was actually inspired by a technological trick" when "one of our programmers came up with a cool trick where we could create images, pieces of art, by packing them into a font. And that allowed us to very quickly bring in new pictures." Meier admits that Pirates! was not intended to provide an authentic, true-to-life recreation of historical piracy. “Pirates! was designed more around your fantasy of pirates than the actual reality,” he said in an interview. “That allowed you to bring in all the stuff from the movies, whatever you had read, whatever was in your imagination." Pirates! was a groundbreaking game in its era. Its puzzles appealed more to female gamers than previous products from MicroProse, a company known for military simulations like F-15 Strike Eagle. Although other open-ended games had already been released, the style of player-directed gameplay in Pirates! led it to be the spiritual predecessor of countless others since, both by Sid Meier himself (Civilization, Railroad Tycoon) and many others. Compute! 's Gazette in 1987 praised the detailed gameplay with arcade and strategic aspects, stating that "the designers of Pirates! set themselves a variety of ambitious goals and succeeded on every count". The magazine concluded that the game "is a real treasure". The game was reviewed in 1988 in Dragon #132 by Hartley, Patricia, and Kirk Lesser in "The Role of Computers" column. The reviewers gave the game 5 out of 5 stars. Pirates! won many awards at the time of its release, including Computer Gaming World's "Action Game of the Year" for 1988, and two Origins Awards: "Best Fantasy or Science Fiction Computer Game of 1987" and "Best Screen Graphics in a Home Computer Game of 1987". Computer Gaming World gave Pirates! five stars out of five in a 1990 survey of historical strategy and war games, and four stars in a 1993 survey of pre 20th-century strategy games, calling it "a genre breakthrough, this is a fascinating simulation of the Age of Piracy". The Australian Commodore and Amiga Review noted excellent manual, educational and historical aspects. Orson Scott Card wrote in Compute! in 1989 that Pirates' use of an unusually strict copy protection was understandable because "the game is so good that even people who drive 55 mph might consider stealing it". He stated that Pirates! seemed misleadingly easy, with players discovering non-obvious nuances to the gameplay. In 1993 Computer Gaming World described Pirates! Gold as adding "three disks of graphical gold" to "a great game engine". The magazine stated that the game "has much to offer a new player and comes with the highest of recommendations", but warned those familiar with the original that "it was "not a significantly revised game with fresh game play". In 1989 Computer Gaming World named Pirates! to its Hall of Fame for games readers rated highly over time, with a score of 9.71 out of 12, and Compute! gave it the Compute! Choice Award for Historical Game. In 1990 Pirates! received the tenth-highest number of votes in a survey of Computer Gaming World readers' "All-Time Favorites". In 1996, the magazine ranked it as the 18th best video game of all time, noting that the Amiga version was by far the best by then. In 2004, readers of Retro Gamer voted Pirates! the 84th top retro game, with the staff noting that "people still play the original version, even though Sid Meier himself produced later versions." In 2005, IGN rated it as the sixth greatest video game of all time. In 2011, Polish web portal Wirtualna Polska ranked it as the fifth most addictive classic game "that stole our childhood". In 2006, abandonware website Abandonia's Sebatianos reviewed Pirates! with "I was impressed by the superior graphics and sounds." In 1994, PC Gamer US named Pirates! Gold the 39th best computer game ever. The editors wrote, "We're recommending the new version of this old classic, because it looks so darn good and it'll be easier for most of you to get your hands on. But the award really goes out to the gameplay that made the original Pirates! great". According to Microprose, Pirates! Gold sold in excess of 450,000 copies by September 1997. The game was widely ported from the original Commodore 64 version, first to the Apple II (1987), then later to the PC (1987), Apple IIGS (1988), Macintosh (1988), Amstrad CPC (1988), Atari ST (1989), Amiga (1990) and Nintendo Entertainment System (1991). The Nintendo Entertainment System port was developed by Rare and published by Ultra Games. Notably, tobacco is replaced as a trade item by "crops" because of Nintendo's family-friendly requirements. The PC version was originally released in 1987 as a PC booter, stored on either two 5.25 disks or a single 3.5 disk. A DOS version was released in 1994 on CD-ROM in Europe, edited by Kixx. While pirated copies circulated as DOS versions, they were the original PC Booter code hacked into a DOS executable; no DOS version was released on floppy disks. The Pirates! Gold remake was released for Windows 3.1, DOS, Macintosh, and Sega Genesis in 1993. It was also released on CD for the Amiga CD32 in 1994 with enhanced CD audio tracks. Sun sighting was not present in this version, and there were no special items. The game did, however, include several new features, such as extra missions assigned to the player by governors. 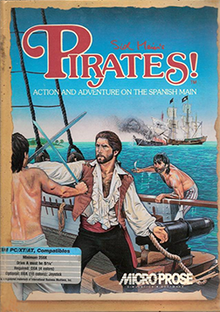 The PC versions were fully modernized CD-ROM games, with VGA graphics, a MIDI score, mouse support, and a copy protection scheme requiring the player to identify the flag of a pirate ship sighted on the horizon. An enhanced remake of 2004, also entitled Sid Meier's Pirates!, was released for Microsoft Windows, Xbox, Xbox 360, Mac OS X, Wii and PlayStation Portable. Sid Meier's Pirates! Mobile was developed by Oasys Mobile in 2008. Mobile versions were later released for BlackBerry (2010) and Apple's iPad (2011). On April 20, 2012, a version for the Apple iPhone and iPod touch was released, published by 2K Games. In addition, the game was ported over to the Windows Phone 7 on April 9, 2012. Tommo purchased the rights to this game and digitally publishes it through its Retroism brand in 2015. ^ a b Schick, Lawrence (January 1990). "Designer's Notes / The Secret History of Sword of the Samurai". Computer Gaming World. p. 84. Retrieved 15 November 2013. ^ a b Brooks, M. Evan (November 1987). "Titans of the Computer Gaming World / MicroProse". Computer Gaming World. p. 16. ^ "Classic Moments - Pirates!". Retro Gamer (132): 30–31. 2014. ^ "Tell Us Something We Don't Know". Retro Gamer (112): 65. 2013. ^ Dredge, Stuart (February 2015). Sid Meier interview: "Learning is part of any good video game". The Guardian. ^ a b Sebatianos (1 October 2006). "Download Pirates!". Abandonia. Abovo Media Group. Retrieved 1 August 2016. ^ Sutyak, Jonathan. "Sid Meier's Pirates! - Review". Allgame. Archived from the original on 15 November 2014. Retrieved 7 March 2013. ^ a b Brooks, M. Evan (October 1990). "Computer Strategy and Wargames: Pre-20th Century". Computer Gaming World. p. 11. Retrieved 16 November 2013. ^ a b Lesser, Hartley; Lesser, Patricia; Lesser, Kirk (April 1988). "The Role of Computers" (PDF). Dragon (132): 80–85. ^ King, Steve (December 1990). "Pirates!". Compute! (124): 98–100. ^ Nigel; Liz; Colin (July 1988). "Pirates!". Amstrad Computer User (44): 53. ^ "Pirates!". Amiga Joker: 45. July 1990. ^ "Pirates!". Amstrad Action (32): 45. May 1988. ^ Ferrell, Keith (October 1987). "Pirates!". Compute's Gazette. pp. 59–60. Retrieved 3 March 2015. ^ "1987 List of Winners". Origins Awards. Academy of Adventure Gaming Arts & Design. Archived from the original on 5 January 2008. Retrieved 12 February 2009. ^ Card, Orson Scott (April 1989). "Gameplay". Compute!. p. 11. Retrieved 10 November 2013. ^ Lombardi, Chris (October 1993). "Scraping Off The Barnacles". Computer Gaming World. pp. 54, 56. Retrieved 25 March 2016. ^ "Game Rating Chart". Computer Gaming World. May 1989. p. 56. Retrieved 3 November 2013. ^ "Microprose Ships Conquer the Skies and Conquer the World, Two Compilations of Top-Selling, Award-Winning Simulation and Strategy Games" (Press release). Alameda, California: Microprose. 16 September 1997. Archived from the original on 20 January 1998. ^ "The Making of Pirates!". Retro Gamer (38): 58–61. 2007. ^ "Sid Meier's Pirates! Gold Plus (Classic)". Valve. Retrieved 3 May 2015. ^ "Sid Meier's Pirates!". Steam. Retrieved 4 May 2015. ^ "Feral Interactive: Rome: Total War". ^ Calimlim, Aldrin (20 April 2012). "Sid Meier's Pirates! Finally Sails To The iPhone". AppAdvice. Retrieved 21 April 2012. ^ "Sid Meiers Pirates! - Windows Phone - IGN". IGN. Retrieved 23 September 2016. ^ "Purchase Agreement between Atari, Inc. and Rebellion Developments, Stardock & Tommo" (PDF). BMC Group. 22 July 2013. This page was last edited on 23 January 2019, at 03:28 (UTC).